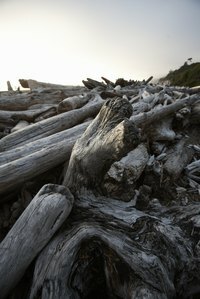 The beauty of wood that has washed to the shore has a timeless quality. The wood has survived and been transformed by the elements. Its beautiful smooth surface is a result of being tossed by waves, dried in the sun and blown by sand. Creating a project from driftwood allows you to enjoy the same beauty in your home that is found at the shore. With a few inexpensive items and a selection of carefully chosen driftwood pieces, your projects bring the feel of the beach into your home. Make a driftwood mobile for your garden or porch by drilling holes through the center of several horizontal, uniformly-sized pieces of driftwood. Tie a knot in one end of a rope, which will serve as the top of the mobile, and begin threading the desired number of wood pieces on the rope. Tie a knot underneath each piece of driftwood as you go along to hold it in place and tie a ceramic or other decorative hanging item on the bottom of the mobile as the finishing touch. Create a decorative wall hanging using a Styrofoam wreath, such as a circle or heart, available from a craft or hobby supply store. Glue small driftwood pieces in various shapes over the surface, completely covering the front and sides of the foam base. Glue small stones and seashells among the driftwood pieces to add interest to the artwork. Make a custom key chain by drilling a hole through a small piece of driftwood, using a drill and small drill bit. Purchase a standard adjustable key chain and key ring at a hobby or craft supply store. Thread the wood onto a small key ring and add it to the key chain along with keys. Create decorative folk art by collecting driftwood pieces that resemble animals, reptiles or other life forms. Paint the pieces to look like the animals they represent, using acrylic paint and simple or abstract brush strokes. Children can help with this project. Cover a mirror or picture frame with a selection of smooth driftwood pieces in a variety of colors and sizes. Add other nautical embellishments such as sea shells, coral, small pebbles and pieces of cork. Use a strong, durable adhesive to attach the wood and all embellishments to the frame. Make a planter for succulents. Use a semi-flat piece of driftwood with a natural hollow in it a couple of inches deep. Plant your favorite succulents in the hollow and place it in the garden to create a nature-inspired look. It can also double as a centerpiece. Secure floral or other thin wire around the top of the driftwood wreath for use in hanging the wreath.